Coming at you with a super simple recipe that features one of my favorite veggies. I know that eggplant preparation discourages a lot of people, or maybe they’ve had a bad experience cooking it before. The bitterness or the unusual texture comes through sometimes. I hope that I can change some perceptions with this delicious dish. 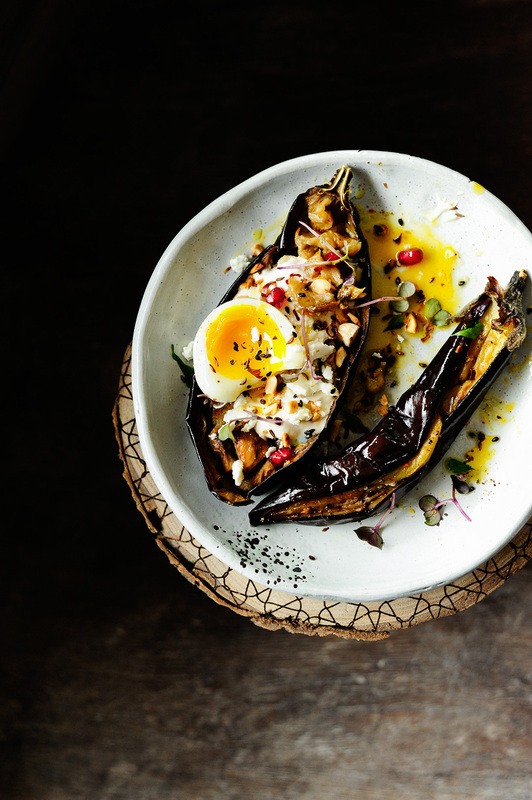 Silky roasted aubergine with a creamy tahini yogurt lemon dressing. Crumbled feta, crunch from the pomegranate arils & hazelnut dukkah fills out the dish, the za’atar spices and a soft boiled egg make it special. I love the contrast of the silky, olive oily aubergine flesh and the crunchy toasted hazelnuts. This tahini dressing is extremely creamy and a lightweight sauce. I love having a crave-worthy sauce. And simple things like sauce can make a significant difference for a lot of dishes. For lot of us, it’s the difference between eating the dish or not. It has to make the meal smooth, moist and hearty. Really, my goal is always to get people to eat dishes that are mind blowing, so please make some sauce for the people you love. It will make a huge difference and add that extra punch to every dish you make. Hope you guys love this one! Cut the aubergines in half lengthwise. With a sharp knife, score the flesh deeply in a diamond cross-hatch pattern, without cutting into the skin. Brush the surface of each half with olive oil and don’t forget to go into the cuts. Sprinkle with salt, pepper and paprika. Place on a baking sheet and roast for 60 minutes at 190°C. In a bowl, combine all ingredients for the tahini sauce, season with salt and pepper to taste. Put the nuts in a well-heated skillet. Toast, stirring and frequently turning until the nuts are golden brown and aromatic. Add salt and sesame, toast for 1 minute more, then set aside to cool. 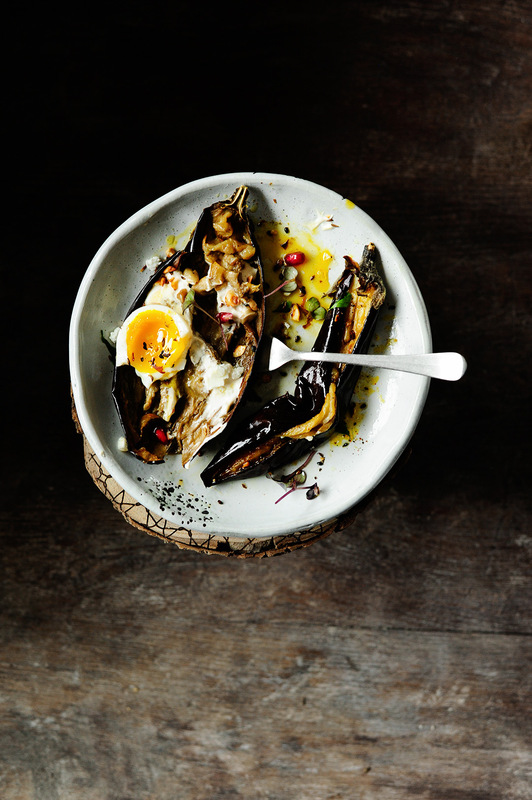 Transfer the roasted aubergines onto plates. Top with tahini dressing, sprinkle with crushed feta, dukkah, za’atar and pomegranate arils. Serve with a soft boiled egg, micro greens and chopped parsley. Enjoy! I think this is one of the most incredible looking dishes I’ve seen in ages. I have to try it! 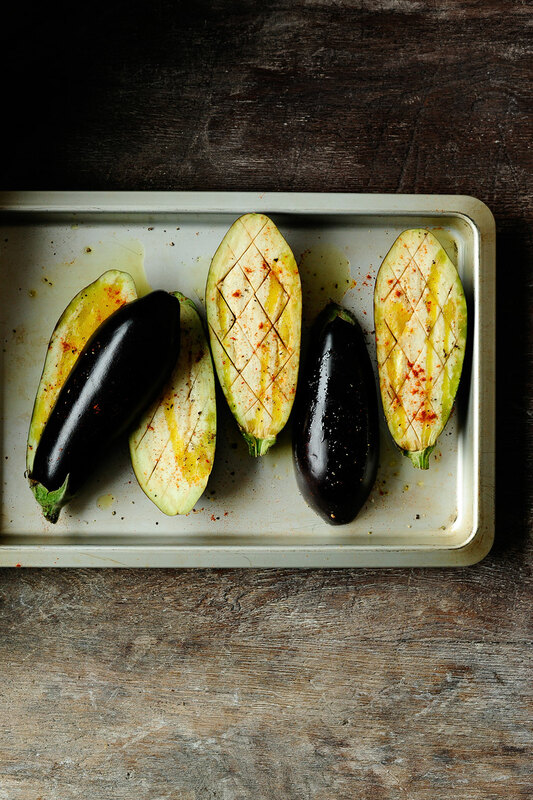 I don’t eat enough aubergine, because I never really know what to make with it… but I think this is about to change! 😉 looks incredible Anna! This looks stunning. The colours and flavours look fantastic! That looks and sounds like an epic meal. I couldn’t agree more about sauce. It can make such a massive difference. As for aubergines, I’ve new to the fold. I used to hate them, but have been cooking them with relish these past 3 or 4 years. so happy to hear Choclette!